Posted on 2013/05/01, 02:13, by aj, under poli-mics. Way back when, I wrote fairly approvingly of the recommendations to simplify the income tax system. 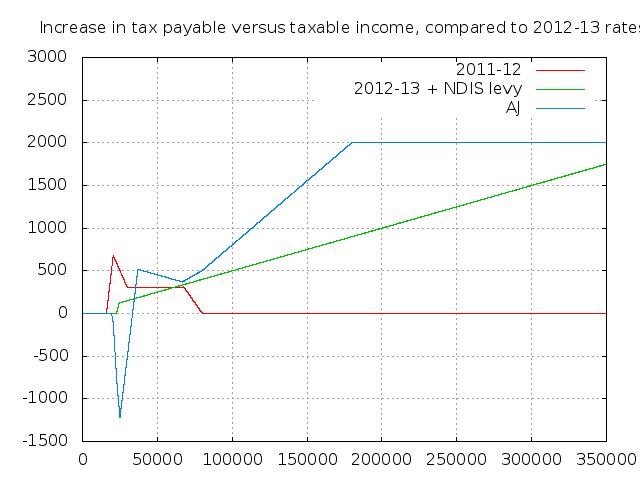 The idea being to more or less keep charging everyone the same tax rate, but to simplify the formulae from five different tax rates, a medicare levy, and a gradually disappearing low-income tax offset, to just a couple of different rates (one kicking in at $25k pa, one at $180k pa). The government’s adopted that in a half-hearted way — raising the tax free threshold to $18,200 instead of $25,000, and reducing but not eliminating the low-income tax offset. 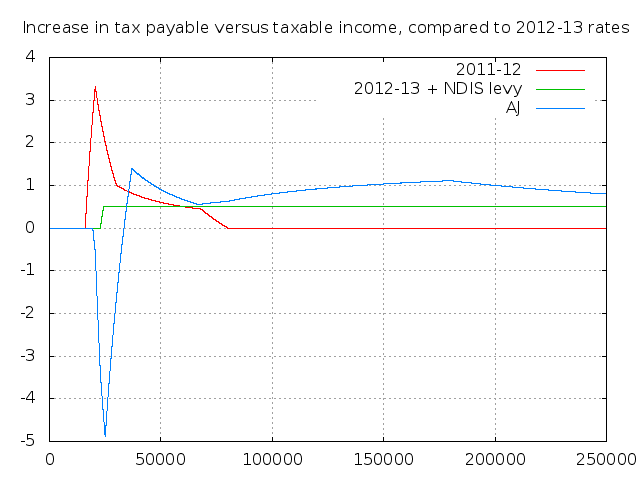 There’s still the medicare levy with its weird phase-in procedure, and there’s still four different tax rates. And there’s still all sorts of other deductions etc to keep people busy around tax time. Anyway, yesterday I finally found out that the ATO publishes some statistics on how many people there are at various taxable income levels — table 9 of the 2009-2010 stats are the best I found, anyway. With that information, you can actually mess around with the tax rules and see what affect it actually has on government revenue. Or at least what it would have if there’d been no growth since 2010. Anyway, by my calculations, the 2011-2012 tax rates would have resulted in about $120.7B of revenue for the government, which roughly matches what they actually reported receiving in that table ($120.3B). I think putting the $400M difference (or about $50 per taxpayer) down to deductions for dependants and similar that I’ve ignored seems reasonable enough. So going from there, if you followed the Henry review’s recommendations, dropping the Medicare levy (but not the Medicare surcharge) and low income tax offset, the government would end up with $117.41B instead, so about $3.3B less. The actual changes between 2011-2012 and 2012-2013 (reducing the LITO and upping the tax free threshold) result in $118.26B, which would have only been $2.4B less. Given there’s apparently a $12B fudge-factor between prediction and reality anyway, it seems a shame they didn’t follow the full recommendations and actually make things simpler. 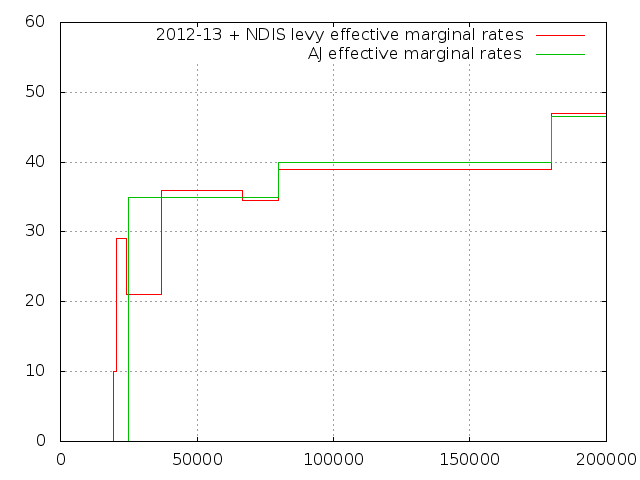 Anyway, upping the Medicare levy by 0.5% seems to be the latest idea. By my count doing that and keeping the 2012-2013 rates otherwise the same would result in $120.90B, ie back to the same revenue as the 2011-2012 rates (though biased a little more to folks on taxable incomes of $30k plus, I think). Personally, I think that’s a bit nuts — the medicare levy should just be incorporated into the overall tax rates and otherwise dropped, IMO, not tweaked around. And it’s not actually very hard to come up with a variation on the Henry review’s rates that both simplify tax levels, don’t increase tax on any individual by very much, and do increase revenue. My proposal would be: drop the medicare levy and low income tax offset entirely (though not the medicare levy surcharge or the deductions for dependants etc), and set the rates as: 35% for earnings above $25k, 40% for earnings above $80k, and 46.5% for earnings above $180k. That would provide government revenue of $120.92B, which is close enough to the same as the NDIS levy. It would cap the additional tax any individual pays to $2000 compared to 2012-13 rates, ie it wouldn’t increase the top marginal rate. It would decrease the tax burden on people with taxable incomes below $33,000 pa — the biggest winners would be people earning $25,000 who’d go from paying $1200 tax per year to nothing. The “middle class” earners between $35,000 and $80,000 would pay an extra $400-$500; higher income earners between $80,000 and $180,000 get hit between $500 and $2000, and anyone above $180,000 pays an extra $2,000. Everyone earning over about $34,000 but under about $400,000 would pay more tax than if the NDIS were just increased, everyone earning between $18,000 and $34,000 would be better off. Not pleasant, I’m sure, on the dual-$80k families in western Sydney who are just-scraping buy and all, but I don’t think it’s crazy unreasonable. There’s spikes at both the $80,000 and $35,000 points which involve 8% and 15% increases in the nominal tax rates respectively, which I think is mostly due to people transferring passive income to family members who either don’t work or have lower paid jobs — if you earn a $90,000 salary better to assign the $20,000 rental income from your units to your kid at uni and pay 15% or 30% tax on it, than assign it to yourself and pay 38%, especially if you then just deposit it back into your family trust fund either way. The more interesting spikes are those around the $20,000 and $30,000 points, but I don’t really understand why those are shaped the way they are, and couldn’t really be sure that they’d smooth out given a simpler set of marginal rates. Anyway, I kind-of thought it was interesting that it’s not actually very hard to come up with a dramatically simpler set of tax rates, that’s both not overly punitive and gives about the same additional revenue as the mooted levy increase. Amazing. I didn’t realise our tax system was that badly warped. That spike in the marginal rate at around $20k is insane. I don’t know why they don’t use a continuous curve. Something simple like y = (log(x^4) + 10)/5 has roughly the right shape so it only has to be scaled appropriately. 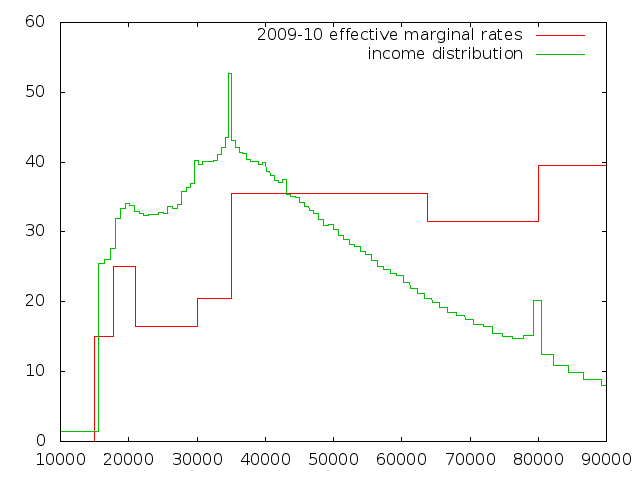 It would get rid of all those discontinuities, and when they go so will the income peaks at $35k and $80k.